Hello there and welcome to the My Monthly Hero March Kit release blog hop. You should have arrived here from the amazing Debby, but if you get lost along the way I have a full list of participants below. What a great kit! Especially good for gardening enthusiasts but great for all round cards too. My first card uses the bunny stamp set and coordinating dies. I started off by taking a piece of white cardstock and cutting this using one of the Rectangle Infinity dies. On to this I added a background for my image with Copic Markers. I added greens for the grass and then a light haze of blue for the sky. I took the fence die form the kit and cut this from white cardstock. I added blades of grass to the bottom so that it blended in to the background better. This was added to the panel with tape runner. The rabbit holding the carrot (there are a few different bunnies in the set with different poses) was stamped on to white cardstock, coloured using Copic Markers and then cut out using the coordinating die. He was added to the panel with foam tape. the sentiment, from the same stamp set, was stamped to the left. The panel was added to a card base with a piece of Foliage Layering Paper on the front, with foam tape. COPIC MARKERS: Bunny - N3, N1, N0, R00. Carrot - YR04, YR12, YR16, YR23. Grass - YG17, YG23, YG03, YG01. Sky - B00, B000, B0000, 0. 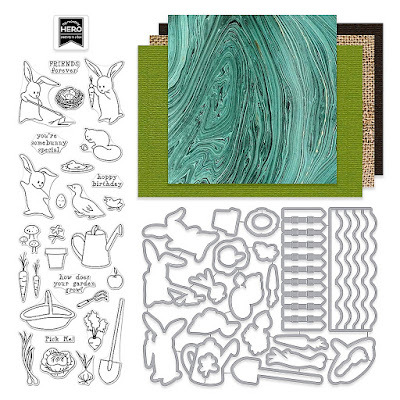 My next card uses the gardening stamp set from the kit. It is filled with lots of different vegetables and can be used for lots of different occasions. I went with with notecard today. I started off by stamping the basket on to a piece of watercolour paper using Antique Linen Distress Ink. Parts of the basket were then masked off as I went, to add the vegetables in to it. The little gardening fork was then stamped in front. The image was coloured using Distress Markers, water and a paint brush. Once dry, I took the sentiment from the Many Everyday Messages set and stamped this on to the panel using brown ink. The panel was then adhered to a 4.25 x 4.25" kraft card base. DISTRESS MARKERS: Basket - Brushed Corduroy. Lettuce - Twisted Citron, Mowed Lawn, Peeled Paint. Carrots - Wild Honey, Ripe Persimmon, Peeled Paint. Onion - Stormy Sky, Antique Linen, Walnut Stain. Gardening Fork - Pumice Stone, Iced Spruce, Weathered Wood. Ground - Antique Linen, Vintage Photo. The kit value is $75 but you can get it for an amazing deal at $34.99 (approx. £28.00). It is limited edition so please grab one as soon as you can if you do not want to miss out. If you love the kits, you may want to think about subscribing so that you do not miss one! Hero Arts are giving away one kit as a prize to one blog reader. The winner is selected from all of the comments left across all of the blogs in the hop so make sure you leave a comment at every step for more chances to win! Giveaway closes on Sunday, March 12th at 11.59pm and the winner will be announced the following week (if the winner has already purchased the kit, they will be reimbursed for it). The next stop in the hop is the amazing Yana. Thanks so much for visiting me today. I hope you have a great day and enjoy the hop! Your note card is beautiful! Love both your cards! I am excited about the fence die being included also, since I have always wanted a fence die. lol I just love this kit and so happy about it being my very first MMH kit ever. thanks for your inspiration. Adorable cards! Love your no line coloring. 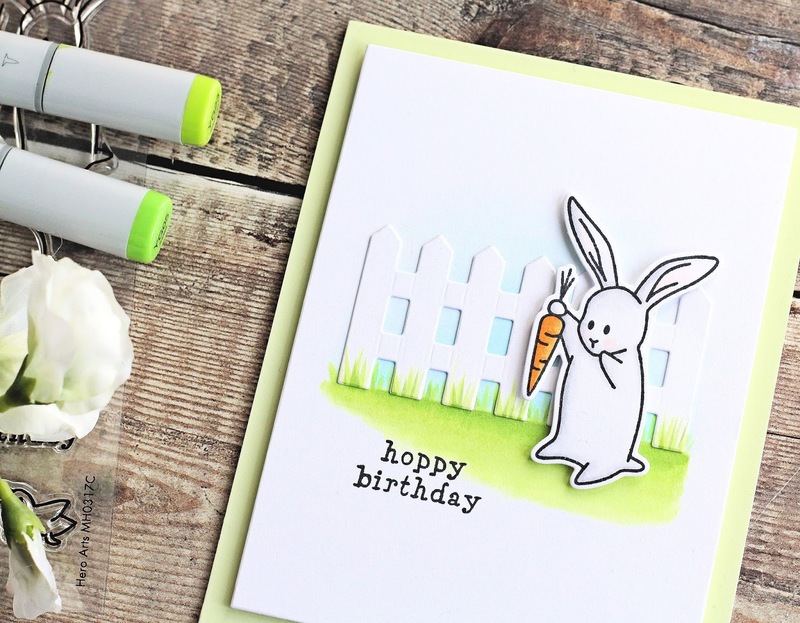 Two adorable cards, Michelle - just love your bunny scene and the vegetable basket!! Love the basket of veggies. So soft and sweet! Lovely cards! I particularly like the watercolored notecard--it is very well done. Great cards. Love the "Just a note" card! The carrot makes a great present as would the beautiful veggie basket! WOW Michelle, these are amazing! What beautiful work! I like the just a note card. I could see that as a note card set for a gardener. Thanks, Erica K.
The cutest kit ever! Love your bunny card. I love both of these awesome creations! Your attention to detail is perfect. This kit really has a lot to offer. 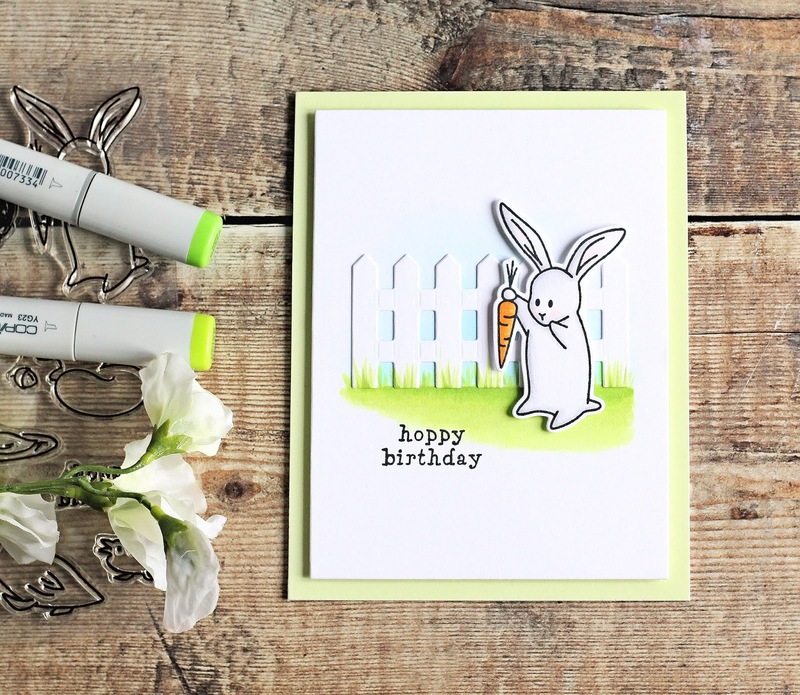 These rabbits are so sweet and your card is perfect! Can't wait to get my kit! What beautiful sweet cards! Thanks for sharing. 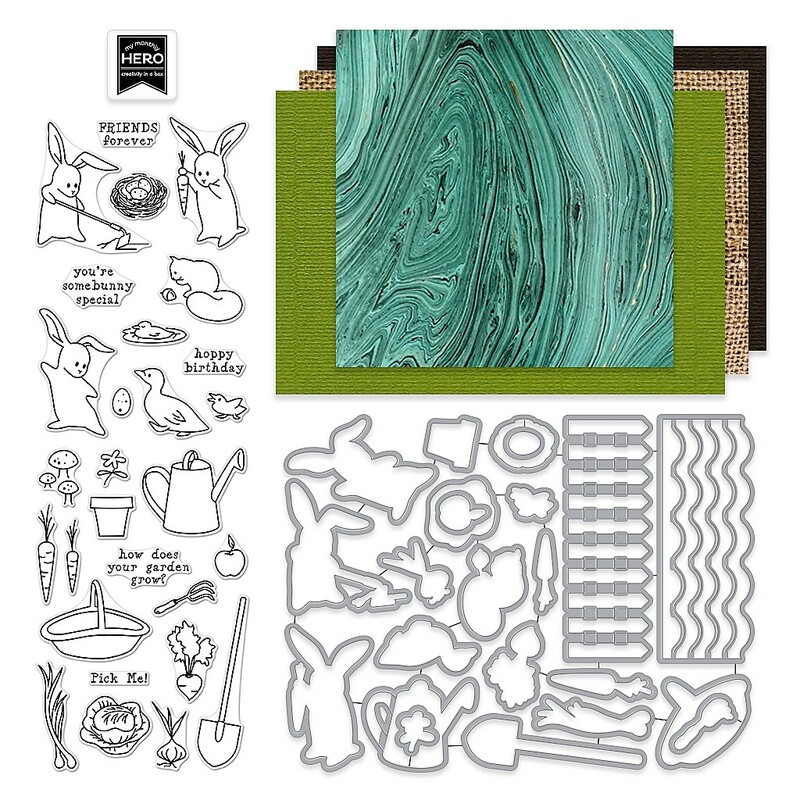 This kit is fantastic and I like the Fungi stamp & Herb stamp add ons too. Both cards are lovely! Great use of the designs from this kit, which is awesome! I love your cards especially the basket of vegetables! I love the little basket you made, very sweet indeed. This whole kit is gorgeous isn't it! Live the cute note card and the Bunny Birthday card is so sweet. Great Job! I love them both but my favorite is the second card with the basket. Beautiful! Love the watercolour gardening basket! Love your style. Just gorgeous!!! What a sweet bunny card! And an awesome basket you made! These bunnies are so sweet! It's amazing how a little detail (adding little tufts of grass on the fence posts) really make something come alive. Nicely done! Thank you. Your coloring is really really good. Especially on the top card with the hint of blue in the sky and the way you shaded the grass is wonderful. I love the little fence die. Both of these cards are beautiful! I can't decide which is my favorite! your design is so sweet! Love how cute the bunny turned out! Cute bunny card. I like the grass. Great coloring of the garden basket. Your cards are so sweet! Thank you for sharing! Sweet, especially the veggie basket. Love the fact that "grown-up" cards can be made with this kit as well as the more "cute" styles. Thanks for featuring both! I love the fence die. I really like your second card. I don't quite have the hang of line-free watercolor yet. Guess I should start practicing. Lovely cards! Awesome stamps and dies to mix and color, with sweet sentiments! Great cards! That note card idea is wonderful. Thanks for sharing!! 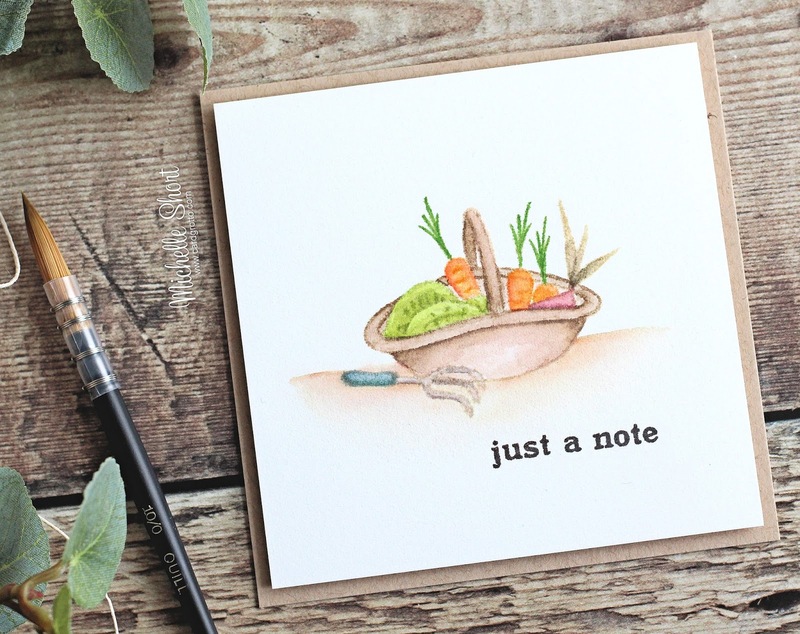 Love your cards, especially the basket of veggies. Your little basket is so sweet, and the birthday bunny card is adorable! Love the vegetable basket card. Wonderful CAS cards. I love the coloring! I love the note cards. The coloring is beautiful! I love the no line coloring images. You've really done a good job. LOVE your cards and this new card kit!! I love the hoppy birthday card. The bunny is so cute! I love the gardening theme and the cards you created from it! Your rabbit card is adorable and I love your veggie basket! Great cards. They feel like spring is finally arriving. Fabulous kit, thank you for the inspiration. Very cute cards. Thank you for taking the time to share them with us. I love how you inspired me with your cards using the new Hero Arts Kit for March 2017.! What cute cards, Michelle! Clean and simple. Nice job! Oh that bunny wishing a hoppy birthday - he is adorable! Michelle, these are simply wonderful! Darling cards! Especially love the second card. I love the grassy bottom of the first card. Cute cards! Thanks for sharing! Great cards. So cute and fun. would love to see a video tutorial on the basket "just a note card." (wink, wink!) Beautiful! I love your cards, super cute! Your cards are adorable! Loving all the possibilities of this kit! Great cards. I'm kinda partial to the watercolor, because that is so hard for me. Lovely work. Love your cards but that basket of vegetables is so fabulous . I would hang this on my kitchen and frame it. The more I see that bunny and it's adorable expression, the more I love it. Your water colour basket is stunning. Very cute cards! The bunny with the carrot i the CUTEST! H's so bright and cheerful! So sweet! Cute cards, and I appreciate the design/assembly details you gave. Thanks! I'm loving the clean and simple lines of your cards - thanks for sharing! AWESOME! I love your watercoloring! Beautiful, first card clea and simple and great coloring on the second. Your watercolored notecard is gorgeous! I like how you blended the grass into the bottom of the fence. I will have to try that ... when I get a fence die! Outstanding Michelle. Enter my name in Hero Arts Monthly Kit. Great idea to watercolor the vegetable basket! wow... both cards are just amazing!! Wonderful cards...love the no line look on the last. Sweet cards. Love your watercoloured basket of veggies and surely the bunny isn't puzzled over what to do with a carrot! Absolutely darling! Cute little bunny with his carrot. Adorable! Very cute cards , clean and simple and springlike! 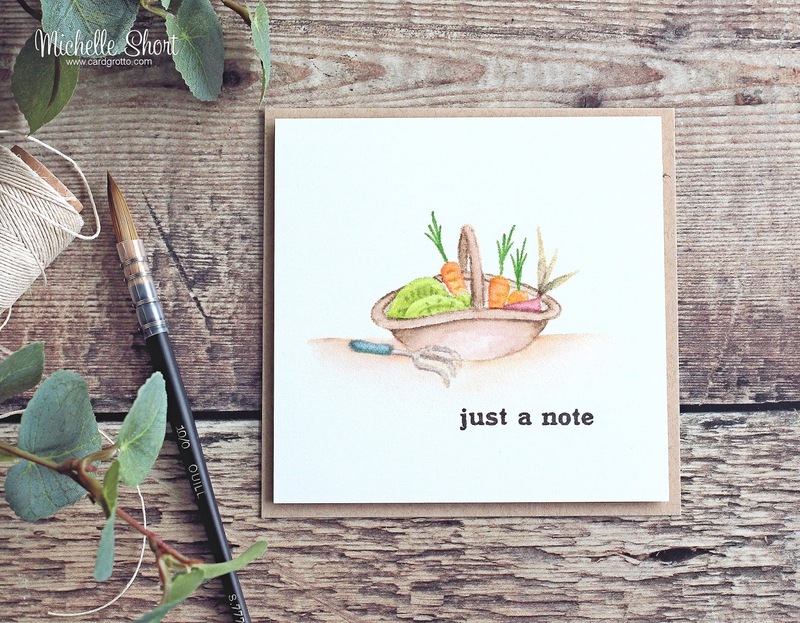 I love the softness of your watercoloring on the "just a note" card. Seems like a daydream from a warm Spring afternoon. I love both cards! Simple but clean looking. Love the fence in the background as well. Love the CAS look of your cards, especially the second one. A great way to showcase how versatile this kit is. Beautiful CAS cards, love that cute bunny and basket of veggies. Love how your fence is incorporated into the card bringing the green color up onto the fence. Just perfect! Both your cards are fantastic! I Your basket of vegetable is watercolored beautifully and the bunnies included in this stamp set are so adorable! The bunny is darling but I do love the basket of veggies too. TFS! So adorable! Love how you added the grass to the fence,it blends in so nicely! Loving the kit this month and all the inspiration! Thanks for the chance to win! The basket of veggies is perfectly colored! I adore that card. Love the watercolored basket card! So cute! I esp love the basket of veggies!! Beautiful cards, love that cute bunny!! Really lovely cards, I adore the bunnies in this kit! Cute projects, I love the cute basket and veggies, done with no line coloring! Thanks for these card ideas. I like the simple style of your layouts. Bother are delightful but there's something about the basket of goodies from the garden that I particularly enjoy. Lovely cards in this post and the one before it, the stamps remind me of the veggie gardens in the Tale of Peter Rabbit. Lovely cards as always. Simple, but very clever. Such cute cards. The note card really struck a chord with me. Awesome coloring and details on these sweet cards! Love that bunny! That bunny is so cute and I would frame the veggie card and put it in my kitchen. Both your cards are wonderful. Very sweet cards, that bunny is so cute!! Love the basket of veggies. Both cards are lovely. Love the CAS designs. Can't wait to play with my kit. Love the way you grounded your scenes - both the grass and dirt line... fab!! Amazing watercoloring on such small detail. Beautiful! Sweet little bunny birthday card. I love the basket card. I"m so glad to see the fence die used on a card. And the veggie basket is so sweet! Love both of you cards! Wow....love both of your cards, amazing! The bunny card is cute but the watercolored basket card is really pretty.. Your cards are gorgeous. Thank you for all the great ideas! Love your cards. The colors are fantastic. This is a great kit and add ons. Absolutely adorable. I just received my kit yesterday and I'm looking forward to trying your ideas. I love the look! Thank you so much Michelle. You are the first person on the blog hop to use only the things that came in the standard kit. I so appreciate having your ideas. lovely cards! yours coloring is amazing! Lovely cards! I love the possibilities of filling the basket with whatever you want in this kit. Great cards! I especially love the basket one - wonderfully colored!